Celebrate Antarctica Day 2018 With Us! Are you studying the frozen planet or the poles? Do you want to learn about the Antarctic Treaty and why we celebrate it on Antarctica Day? The UK Polar Network are working alongside Our Spaces to offer you the opportunity to learn more about this and to design and send an Antarctic flag out into the field with a fantastic team of polar researchers! On December 1st 1959 (almost 60 years ago!) 12 nations signed the Antarctic Treaty, a document declaring that Antarctica would be off limits to military activity and setting it aside as a place for peace and scientific discoveries. As of 2010, December 1st has been celebrated each year to mark this milestone of peace and to inspire future decisions. We hope to extend the celebrations worldwide through our Antarctic Flags initiative; giving new generations the opportunity to learn about the Antarctic Treaty and to share, interpret and cherish the values associated with Antarctica! Are you a researcher travelling to Antarctica this year (2018 - 2019)? If you are heading to Antarctica or any of the surrounding Antarctic islands this winter (November – January) please get in touch, we would love your help! 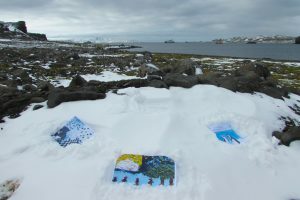 All we ask is that you take some flags (however many you are willing to take) sent to you as a pdf or jpg and photograph them in Antarctica as proof that they have made it there. How you choose to do this is totally up to you, you can be as creative as you like! We will then ask you to please send them back to your contact on the UKPN committee who will sort out sending these back to the schools. Are you a school teacher/ individual interested in sending a flag to Antarctica? The idea is that following a lesson(s) on Antarctica, your students design a flag for the Antarctic - as it does not have its own - based on what they have learnt. We would like to emphasise that we can only accept a maximum of five flags per school or classroom so you could get your students to design their own flags and then select your ‘top five’ or you could design a couple in groups/ as a whole class or year group. Please ask your students to consider their design/ colour choices as they want to be able to see that it is theirs from a distance (remember that it will be surrounded by lots of bright white snow!). We then ask you to send us a pdf of your flags (ideally scanned in as sometimes photos are difficult to see) and we will match them up with a researcher or engineer who will take them with them on their journey to Antarctica. 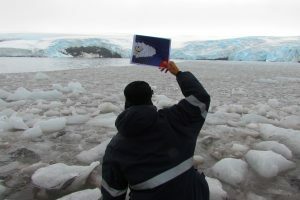 A photo will be taken of the photos in Antarctica and you will receive this, as well as a certificate letting you know where your flag(s) travelled to. So far we have had schools and researchers from over 20 countries involved in the Antarctic flag initiative and we would love to have your school join us this year! If you would like to register your interest, please fill in this form by October 31st 2018. Following this we will work on matching school groups to researchers and provide you info in due course about how you can upload your flags (the deadline for this will be the 23rd November 2018 to ensure as many flags as possible are pictured close to Antarctica Day (December 1st)). We are keen to maintain a relationship with the school after so please do get in touch if you would like to organise a visit/ skype with a scientist. Alternatively, get in touch with education(at)polarnetwork(dot)org if you would like to send a letter to a Polar Pen Pal who will be able to answer any questions your class may have about research and life in the field! Please get in touch with emma.lewington(at)polarnetwork(dot)org or emma.pearce(at)polarnetwork(dot)org . Make sure to follow us on our social media accounts (twitter and facebook ) where we will be counting down to Antarctica Day 2018 and regularly uploading photos!